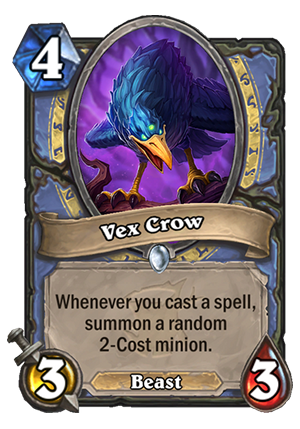 Vex Crow is a 4 Mana Cost Common Mage Minion Beast card from the The Witchwood set! Whenever you cast a spell, summon a random 2-Cost minion. Rating: 3.6/5. From 2107 votes. This is a bit like a new version of Flamewaker. Both have synergy with cheap spells, and both can be combo’d with cheap spells for amazing effects. This effect is obviously stronger, that’s why it costs 1 more mana. Now, that one extra mana is actually a significant problem. Compared to Flamewaker, you will often have to wait an extra turn to get some value out of it. With Coin, the problem isn’t that big. You can play this + Coin + 1 mana spell on Turn 4 and it will already be good. But without Coin, you’d often have to wait until Turn 6-7 before you can really start comboing this. You COULD theoretically drop it on Turn 4, but 3/3 minion is very easy to remove in the mid game, so you’d aim to get instant value from it. 2/4 on Turn 3 was much more likely to survive. Another problem is randomness of the 2-drops. On the one hand, you can get a 4/4 (infamous Millhouse Manastorm), on the other you can get a 1/1 or even a Doomsayer. There will be lots of variance here, similarly to how Piloted Shredder worked. Mage has access to some cool 1 mana spells. 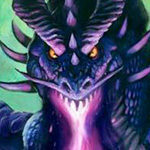 Starting with the classic Arcane Missiles, which will combine a slight AoE board control (or burn damage) with summoning 2-drops, then Mirror Image, which will summon 3 bodies in total, and finally Breath of Sindragosa, which might finally find its home (there was no reason to play it before, as Tempo Mage wasn’t playing lots of spell synergies). The card also synergizes very well with Primordial Glyph. If you can pick some cheap spell out of it (2 or less mana), then you get two 2-drops AND a 2 mana spell for just 2 mana, which is crazy tempo gain. Overall, I think that this card has potential to be strong. Since tons of Secret synergies are going out, we might see a more classic approach to the Tempo Mage, with more spell synergies, including this card. Whether this card is playable might be heavily tied to whether we see another strong cheap spell for Mage, or maybe another Spell synergy. Right now I’m giving it 6 out of 10, but the rating might get higher if that happens. 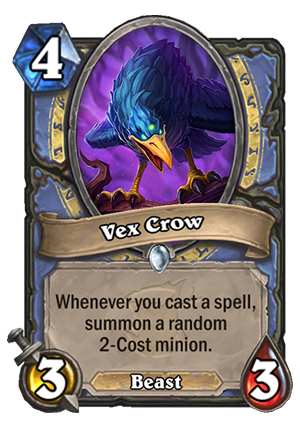 Hmm,interesting,playing it in turn 4 is very good cause you won’t lost so much valor(quite the opposite considering it is more dangerous than a simple yeti for example,so your opponent will cast mana and cards to kill that)and if you do that everytime you can,you guarantee atleast half of these times the raven will survive to gain a absurd advantage!! 4 star card! It’s safe to say that this card won’t see competitive play. I intend to experiment with this card in wild, but don’t know if it’s good in standard, really. It’s really easy to kill a 3/3 on turn 4. It all depends on how many good cheap mage spells are there. If this would be priest card, it would be epic. Whoa this might be really good… Aaaaand then u summon Doomsayer RIP ! Best idea is to cast cards like Frost Nova and Blizzard, as long as you don’t have too many minions or valuable ones on the board. This way if you get a Doomsayer, you have a much better chance of clearing the board. If you don’t get the doomsayer, short of charge minions, rush minions, silence minions, and minions with battlecry and/or combo removal effects, and non-minion removal, you can attack the following turn unimpeded (barring taunt creatures), and yes I realize that “short of list” covers a lot of things, but the bottom line is that short of silence, bounce and replay, or cube effects, none of the minions on your opponent’s side at the time Blizzard or Frost Nova are successfully cast, can attack your minions. 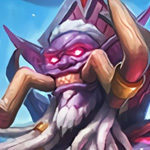 Anyway Its probably better to plan on using it as a control card with the Doomsayer being generated as a very real possibility, then when you’re pleasantly surprised by not getting it, switch to a aggro strategy with your minions, only trading to keep the raven safe, unless you can calculate and confirm lethal damage by going to face with the minions and the current cards in your hand and possibly your deck if your down to your last card or few cards and you know based on what you’ve already played that they all can hit for lethal. Percentage will be much higher in Standard then in Wild with what’s rotating out to get Doomsayer, even if we get a decent number of two drops from witchwood. It will happen how many times? If a non-secret variant of Tempo mage comes into the forefront of the metagame, this will be a major part of it just because it will create a ton a value. However, it won’t make the deck by itself like Flamewaker did. If the archetype gets something similar to Kabal Crystal Runner, Tempo mage will be playable again with or without the secret support. This card will allow Mage to potentially fill the board on turn 4, the question is how reliably will this happen. With Sorcerer’s Appentice and Primordial Glyph you can have several 0 cost spells On turn 4. Ideally play glyph on 2, apprentice on 3 and this on 4 and hope you have a mirror Image to help protect the board you create. Can’t wait to test this out. Just a very cool card. 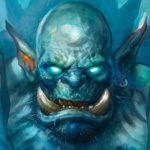 Obviously blizzard wants those Trolden videos as they are promoting Hearthstone and they will get them, because the power level is very high. Just compare it to the old 4 mana 3/5 that summoned a 1/1. This card is a class specific, but at the cost of 2 health, you get minions with effects that on average have a lot more stats. I remember playing summing stone and cheap spells were the sweet spot and this card gives you better minions playing cheap spells and a better body(3/3 > 0/5). This card is very underrated and will be flavorwise one of the favorite cards of any Hearthstone player. A lot of fun. Has a reminiscence to Piloted Shredder, although it needs two spells in order to get more value… It’s an OK card I believe. Not too good in Arena. 3 stars out of 5. Would probably be good most other classes. Mage however, doesnt care so much for building a strong board with minions, but rather likes to remove stuff, get chip dmg in, and burn the hell out of their opponent. I think that having a body on the board that allows you to build up your side while also casting those spells is something exciting, though. I like all these new beasts with cool effects. DK Rexxar will be really fun when he’s updated. DS Rexxar only uses hunter and neutral beasts. That’s right. Just got too excited. I see this as a turn six or seven play… this and a Frostbolt or whatever, and you get two creatures for 4 mana. Depends on if a mid-range/on curve type of deck for Mage works out, and this is a flex slot… maybe play it on turn four if curving well and not under pressure, or hold as a mid-late card to help retake the board. As always, it depends on what kind of decks are viable, and what options there are at the various slots. 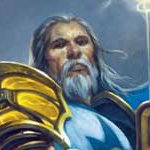 With Ice Block gone, we can’t have any idea what Mage will look like in the new world order. This is all fun and games, until you roll a doomsayer. Then you scream, and immediately remove the card from your deck. 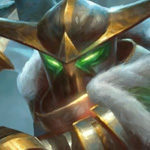 In that same sense, playing it with Frost Nova and THEN getting that doomsayer would be pretty litty. 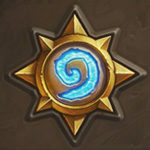 if the set have good cards for early game, maybe a tempo mage is comming ? Do you mean midrange mage? Cause 4 mana for a 3/3 minion that summons more stale minions isn’t tempo. Plus, tempo mage already exists. I don’t think mage has the cards for it, but I could actually see this supporting aggro. Get a board on turns 1-3, have a bad turn 4 with this, then use spells to protect your board while simulaneously replenishing it. I just don’t think mage has the cards to do something like that. Describing A situation in which your receive tempo from this card does not make this a tempo card. Not to mention that the two cards described above are tempo cards apart from their use with Vex Crow. Not sure how this would improve tempo mage. Violet teacher saw most of it’s play in token druid. The most tempo deck of the last year. I consider Token Druid aggro, not tempo. Then you are wrong. Token druid needed the board to do anything. Agro has reach.